PHOTOS WILL BE TAKEN ON TWO DIFFERENT DAYS - During this two-day photo session John will be taking photographs of ALL the children at our school. No class photos! There are no envelopes and no pre-payment. All photographs will be posted on the JA Photography website. Please see below to find out which day your child(ren) will be photographed. ON TUESDAY, APRIL 30, 2019: JOHN WILL PHOTOGRAPH THE TUESDAY, THURSDAY, FRIDAY TODDLERS, ALL PRESCHOOL STUDENTS AND ALL KINDERGARTENERS, PLUS ALL SIBLINGS FOR GROUPS LISTED ABOVE, REGARDLESS OF CLASS. ON WEDNESDAY, MAY 1, 2019: JOHN WILL PHOTOGRAPH THE MONDAY & WEDNESDAY TODDLERS, AND THE MONDAY THRU FRIDAY TODDLERS. HE WILL ALSO PHOTOGRAPH ALL ELEMENTARY STUDENTS, PLUS ALL SIBLINGS FOR GROUPS LISTED ABOVE (UNLESS THEY HAD THEIR PICTURE TAKEN ON TUESDAY). •FRIDAY, MAY 10, 2019, "The Little Mermaid" MATINEE, 10:30 AND EVENING SHOW, 7:00: KINDERGARTEN AND ELEMENTARY WILL PERFORM BOTH SHOWS. 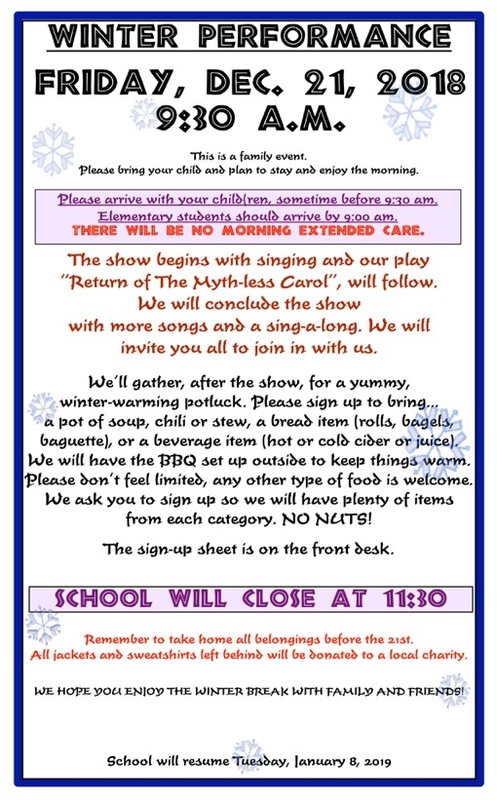 TODDLER AND PRESCHOOL WILL ONLY PERFORM AT THE MATINEE. •MONDAY, MAY 27, 2019: SCHOOL WILL BE CLOSED for Memorial Day. Please be sure your child has a nutritious breakfast and arrives to school on time. If you have not already done so, PLEASE return your deposit and the Enrollment Form you received in your Parent Cubby. If your child is not returning to Children's House, please let us know on the form. Thanks! •AUCTION PACKETS HAVE BEEN SENT HOME! AND RESERVE YOUR DINNER RESERVATIONS! Please see email from your child's classroom or see your child's teacher for specific instructions regarding valentines and classroom procedure. Please be sure to come! Let your child show you all the wonderful things he or she has been doing at school! •FRIDAY, JANUARY 18, 2019, 2:00-3:00 PM: ELEMENTARY STUDENTS HONOR MARTIN LUTHER KING, in Steve's Barn. If you have not yet signed up, please do so. If you do not see a sign-up sheet posted on, or next to, the door of your child's classroom, please see your child's teacher. Remember, there is no school for all students on Friday, Feb.1st. Please try to schedule your conference on Friday. If Friday will not work for you or the sign-up is full, please see the alternative schedule for your child's teacher, Monday thru Thursday (1/28 - 1/31) or speak to the teacher to arrange a convenient time and date. School resumes Monday, February 4, 2019. *IMPORTANT NOTE: We will NOT provide Extended Care, on Friday, before 9:00 or after 3:00. Please watch for emails or see your child's teacher for specific instructions regarding valentines and classroom procedure. SO WE HAVE A BALANCED ASSORTMENT OF DELICIOUS FOOD! Bring your food directly to the back patio tables before the performance and continue on to the barn and find a seat. Don’t forget to pick up your plates, platters, bowls and utensils when you leave. DECEMBER 24th THRU JANUARY 7th. RAN A TOTAL OF 3,670 LAPS (367 MILES)! Once again, we are so proud and impressed by the passion, commitment, determination and stamina, of every child who participated in the Jog-A-Thon fundraiser for the must! 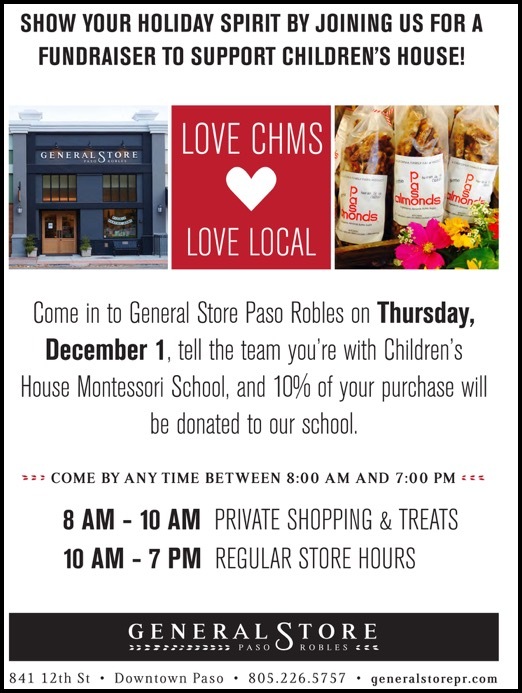 charities - ECHO, Atascadero. A huge thank you to all the parents, family members and alumni who came out to help and participate. It was a great event and a huge success again this year! We know all of you are now busy collecting the donations. Please write your checks to must! charities and remember, your donation is tax deductible. We do not need you to return the sponsor sheets. Your donations can be placed in the envelope on the small bulletin board, across from the Lower Elementary classroom door. You can print out the "thank you receipt" and fill it out for everyone on your pledge list. Please have your student fill this out with you! Please don't hesitate to email if you have any questions. Many, many, thanks, once again. This year, as always, we will celebrate Thanksgiving with a family gathering. We will all meet in Steve’s Barn. 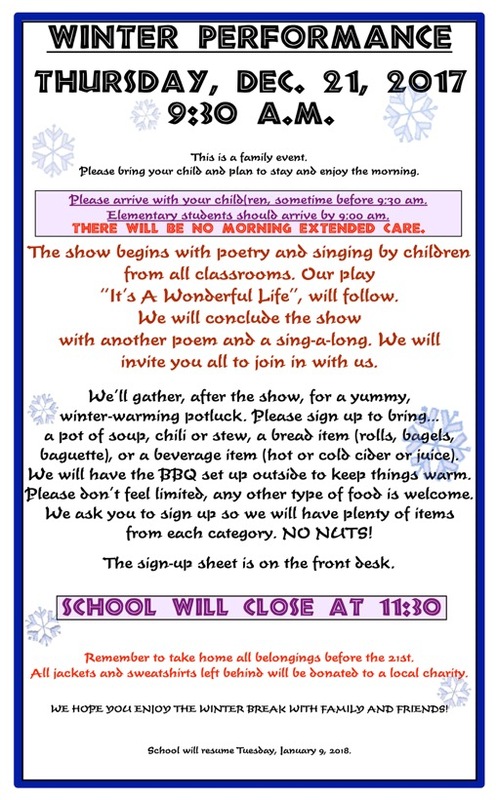 The children will be reciting poetry and singing songs. Please arrive promptly at 9:15 for this event. 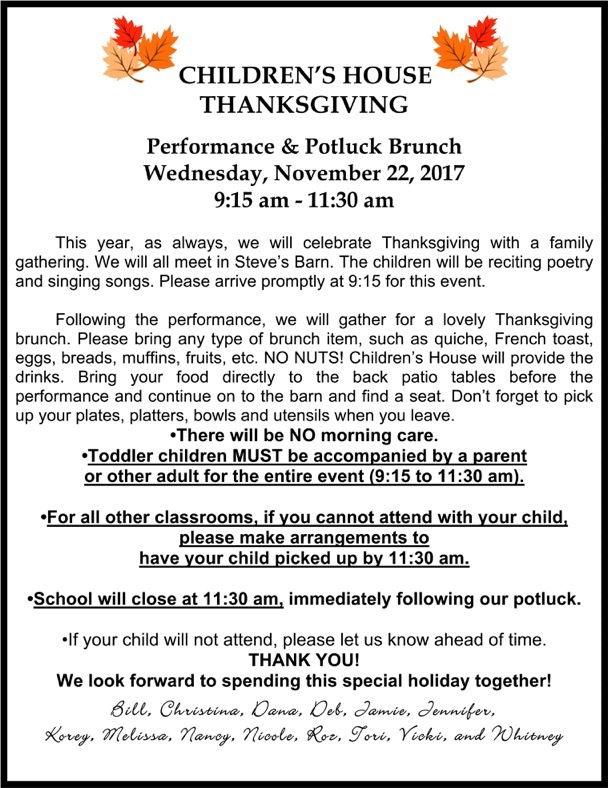 Following the performance, we will gather for a lovely Thanksgiving brunch. Please bring a brunch/breakfast item, such as quiche, French toast, eggs, bacon, breads, muffins, fruits and beverages. NO NUTS! •School will close at 11:30 am, immediately following our potluck. 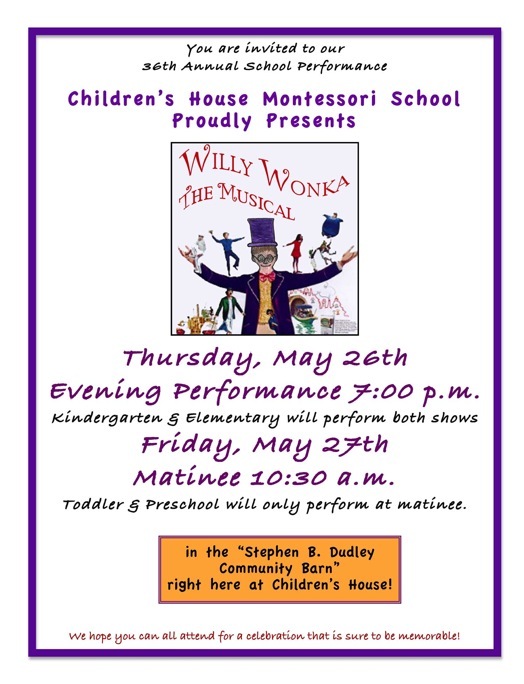 •If your child will not attend, please let us know ahead of time. •THURSDAY, NOVEMBER 22 and FRIDAY, NOVEMBER 23, 2018, SCHOOL WILL BE CLOSED for the Thanksgiving holiday. A great way to spend the day "post Halloween"
For toddlers, primary, kindergarten and lower elementary. Slippers are great for the classroom, however, your child will need shoes for the playground! Again this year the entire school (even some toddlers) will participate in our 8th annual Jog-a-Thon. All proceeds will benefit ECHO (El Camino Homeless Organization) thru must! charities. Parents, you have a letter and sponsor sheet for each child, in your Parent Cubby. Last year we raised $5000.00. Let's do it again, plus more! REMEMBER: You do not need to return the sponsor sheet, only the donations! This is a completely separate event from our school wide potluck on Wednesday, (see below) and takes place in the Lower Elementary classroom, only. Lower Elementary parents, please see the food sign-up on the classroom door. If you have any questions, please see Nancy. •TUESDAY, NOVEMBER 20, 2018 - United Blood Services will bring the Blood Mobile to CHMS! Sign-up at the front desk or online. They will be in our parking lot from about 8:30 am to 12:30 pm. Give Blood! We recognize that Halloween (Wednesday, Oct. 31) is a great deal of fun for many families and every family has their own traditions. Going on a Sunday excursion to choose a perfect pumpkin may be one. Sitting around the dinner table while Mom or Dad carve a pumpkin and bake the seeds in the oven, may be another. Of course dressing up with make-up and posing for pictures is a tradition for many. At Children’s House, however, especially with the younger children, we keep Halloween pretty low key. A mask project or pumpkin carving may be going on or perhaps face painting on Halloween afternoon. The older children learn about the history of the holiday and some variations in various cultures. The upper elementary class will be gone the day of Halloween, so today, 10/26, they paid tribute to men and women in history and each student dressed as a historical person they had researched. They presented a first person report to their classmates and also took a walk around to the other classrooms to tell the children who they were. With the exception of the upper elementary, it is our policy, however, not to have the children come to school in any type of costume. This includes toddlers, primary, kindergarten and lower elementary children. In addition to hampering free movement, it may lead to hurt feelings if some children do not, or cannot participate. Please remember, it is also a school policy that candy or sweets of any kind NOT be sent to school. It is extremely hard for children to see others bringing “treats”. Please help by passing this information on to any family member who makes the lunch or drives to school. •If you purchased a produce bag for our fundraiser, don't forget to pick it up, TUESDAY, OCTOBER 2nd, after 1:00pm. •TUESDAY, OCTOBER 16 and WEDNESDAY, OCTOBER 17 ARE BOTH PICTURE DAYS! John Alden, from J.A Photography, will be taking individual portraits as well as class/group pictures. John has been photographing Children's House students for over 25 years. all siblings for the groups listed above, regardless of class. He will also be shooting ALL class photos on Tuesday. Parents of Monday/Wednesday toddler children, please bring your child to school on Tuesday for the class photo at 11:30 am. This time is approximate and you may or may not need to wait for a bit. On Wednesday, John will shoot individual portraits for the Monday/Wednesday toddlers, the Monday thru Friday toddlers and all preschool children. Please make every effort to have your child here. This is the only chance you have to insure your child is included in his or her classroom photo. Photo envelopes will be in your Parent Cubby two or three weeks prior to Picture Day. Please return your completed photo envelope with payment, to the basket above the primary/elementary parent cubbies by Friday, October 20th. Your child will not be photographed if you do not return envelope with payment. Our annual school roster will be out as soon as we get everyone to check their info! It will be distributed to all families. If you have not already done so, please check one of the rough draft copies, posted on the Primary sign-in sheets or on the front desk, to make sure all the information is current! Feel free to make any necessary changes. Please initial after you have checked your info (even if everything is correct). Our roster includes email addresses. If you do not wish to include your email, address or phone number on our roster, please let us know. FYI: This is not for school staff to contact you in an emergency. We have special emergency cards for that. This is not for your child's teacher to send you an email, see Dana if you want to add or change your email contacts. This is for parents to contact one another or children to get in touch with friends, etc. •We have a lot going on at school right now! REMINDER: CHECK YOUR PARENT CUBBY EVERY DAY! If you are not sure where it is please ask a staff member or another parent. •PARENT PROJECT VOLUNTEER FORMS: YOU RECEIVED A LETTER AND A GREEN FORM IN YOUR PARENT CUBBY! We have lofty goals and great visions for enhancing your children's educational, emotional, and spiritual experiences. In addition to your financial support, your physical support also helps us to realize these goals. Our fundraisers and many of the “jobs” and/or projects can simply not be done without you. As many of you know from years past, your children enjoy having you participate at “their school”. They learn so much from the spirit of dedication and commitment that your support models. PLEASE RETURN YOUR FORM, WE NEED YOUR HELP! An upper elementary fundraiser for filed trip costs..
Local Templeton supplier, Melanie Blankenship of Nature’s Touch Nursery and Harvest, will deliver produce bags to our school every Tuesday afternoon beginning Oct. 2nd through Dec. 18th. The bags will contain a variety of fresh, certified organic, vegetables and fruit locally grown in California. Melanie is committed to providing the highest quality organic produce, and works hard to use local farms. If you are interested in participating in this Fundraiser please print and return the form with your payment or pick up a form at school. Checks should be made payable to Children’s House Montessori School and put in the basket labeled “PRODUCE BAGS” in the school foyer area. Please return your form and check by Tuesday, Sept. 25th. PLEASE SHARE THIS INFORMATION WITH FRIENDS AND CO WORKERS WHO MAY ALSO WANT TO PARTICIPATE! You can pick up your bag inside the coffee shop (MOCHA) beginning at 1:00 pm. on Oct. 2nd. If you are unable to pick up your bag please make arrangements for pickup by someone else. Any bags not picked up by 3:00 pm Wednesday will be donated to the school for student and staff use. •FRIDAY, SEPTEMBER 7, 2018 Orientations are for new students in Toddler and Primary (including Kindergarten), attending for the first time. Elementary students are also welcome, if it is deemed necessary. Students enrolled during Summer do not need to attend an orientation. Please join us as we kick off the new school year and gather together for our annual potluck (appetizers and drinks only) on Saturday, Sept. 8. This is an informal open house...come any time between 2:00 and 4:00 pm and bring an appetizer. This is a great opportunity for the children to get acquainted or reacquainted with school, their friends and teachers. It is also a valuable time for parents to see old friends, meet new families, set up carpools and chat with teachers! Hope to see you all here! *If you still have forms that need to be filled out and returned, please bring them to us before school begins. WE MUST HAVE THE FOLLOWING FORMS ON FILE BEFORE YOUR CHILD CAN BEGIN SCHOOL: A CURRENT EMERGENCY FORM, A CURRENT CONSENT FOR MEDICAL TREATMENT FORM, AND A CURRENT CALIFORNIA IMMUNIZATION FORM (PARENTS OF NEW STUDENTS AND KINDERGARTEN STUDENTS, YOU ARE MANDATED BY THE STATE OF CALIFORNIA TO PROVIDE CURRENT IMMUNIZATIONS FOR YOUR CHILD). If you have not yet returned your forms, please do so BEFORE THE FIRST DAY OF SCHOOL. The sooner we can get your child's file completed, the better. It will also make the first week run smoother. Thank you. •REMINDER: Please mark your calendars for the very important PARENT ORIENTATION MEETINGS, scheduled for each classroom. Even if you have had a child in one of these same classes in a previous year, your attendance at the Parent’s Night will give you valuable information regarding THIS year’s plans. We strive to make our school better each year and therefore change the way we schedule our days, use our materials, do homework, etc. We appreciate your questions and your input at this initial meeting so we can begin a wonderful year together of consistency, clarity and on-going communication. Please come! •MONDAY, SEPTEMBER 10, 7:00 - 8:30 PM / PRIMARY (PRESCHOOL & KINDERGARTEN) this Parent Meeting is the first day of school! Thank you so much for being a part of our Children’s House family, and for sharing your wonderful children with us. We look forward to a great year. •MONDAY, MAY 28, 2018: SCHOOL WILL BE CLOSED for Memorial Day. 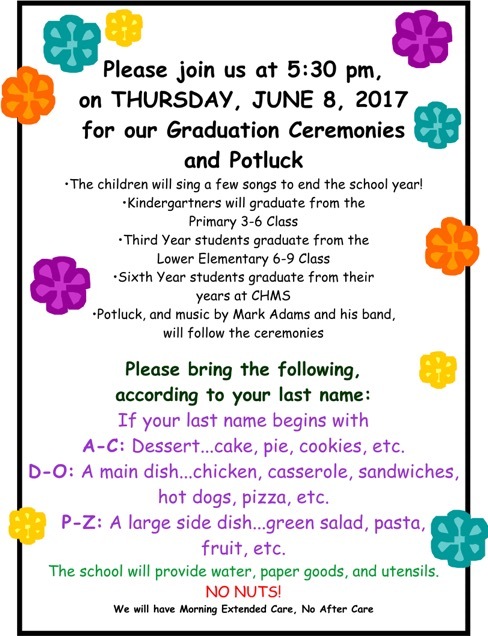 •The children will sing a few songs to end the school year! 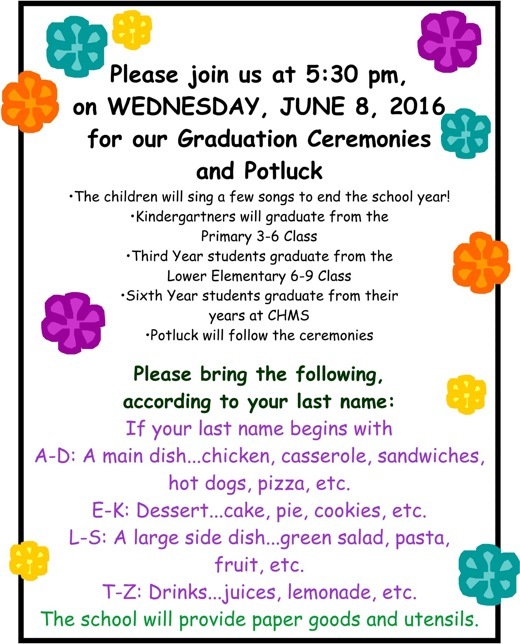 •Potluck will follow the ceremonies. A-F: A main dish...chicken, casserole, sandwiches, hot dogs, pizza, etc. G-P: A large side dish...green salad, pasta, fruit, etc. Q-Z: Dessert...cake, pie, cookies, etc. The school will provide water, paper goods, and utensils. We will have both Morning and After School Extended Care. We will have morning Extended Care as usual. School will close at 12:00. 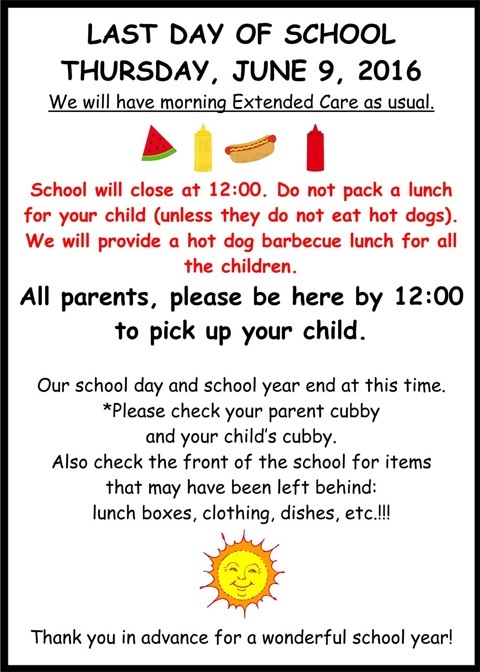 Do not pack a lunch for your child (unless they do not eat hot dogs). 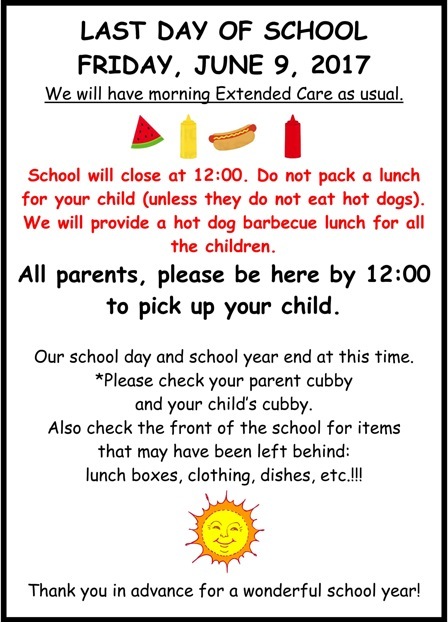 We will provide a hot dog barbecue lunch for all the children. All parents, please be here by 12:00 to pick up your child. Our school day and school year end at this time. *Please check your parent cubby and your child’s cubby. Also check the front of the school for items that may have been left behind: lunch boxes, clothing, dishes, etc.! 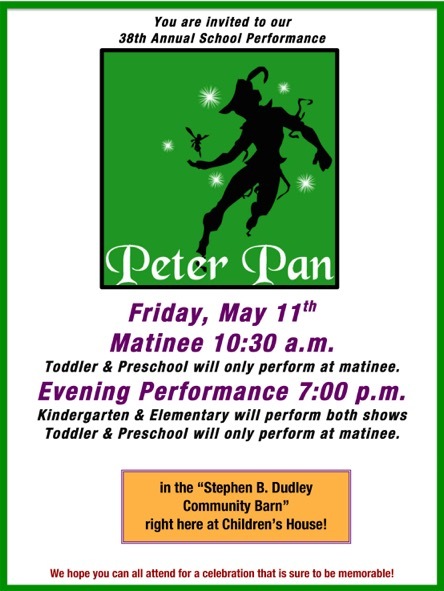 •FRIDAY, MAY 11, 2018, "Peter Pan" MATINEE, 10:30 AND EVENING SHOW, 7:00: KINDERGARTEN AND ELEMENTARY WILL PERFORM BOTH SHOWS. TODDLER AND PRESCHOOL WILL ONLY PERFORM AT THE MATINEE. SEATING IS LIMITED. PLEASE SIGN UP FOR SEATS AT THE FRONT DESK. During this two-day photo session John will be taking photographs of ALL the children at our school. No class photos! There are no envelopes and no pre-payment. All photographs will be posted on the JA Photography website. Please see below to find out which day your child(ren) will be photographed. ON TUESDAY, MAY 1, 2018: JOHN WILL PHOTOGRAPH THE TUESDAY, THURSDAY, FRIDAY TODDLERS, AN ALL PRESCHOOL STUDENTS, PLUS ALL SIBLINGS FOR GROUPS LISTED ABOVE, REGARDLESS OF CLASS. ON WEDNESDAY, MAY 2, 2018: JOHN WILL PHOTOGRAPH THE MONDAY & WEDNESDAY TODDLERS, AND THE MONDAY THRU FRIDAY TODDLERS. HE WILL ALSO PHOTOGRAPH ALL KINDERGARTEN AND ELEMENTARY STUDENTS, PLUS ALL SIBLINGS FOR GROUPS LISTED ABOVE (UNLESS THEY HAD THEIR PICTURE TAKEN ON TUESDAY). •FRIDAY, MAY 11, 2018, "Peter Pan" MATINEE, 10:30 AND EVENING SHOW, 7:00: KINDERGARTEN AND ELEMENTARY WILL PERFORM BOTH SHOWS. 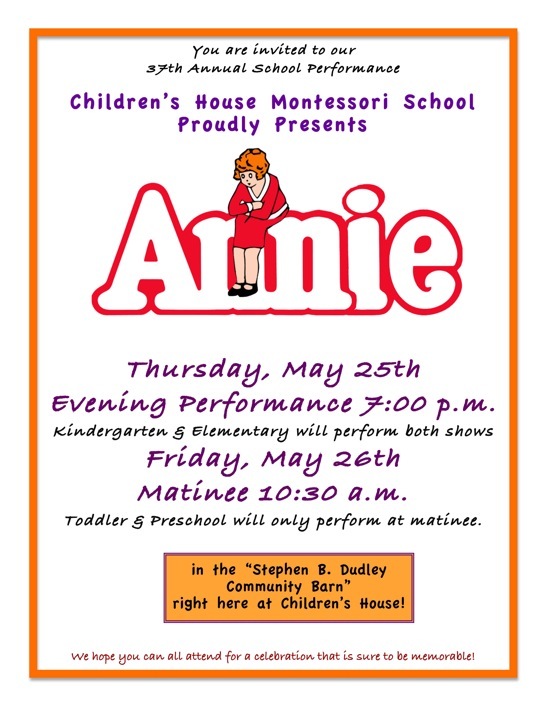 TODDLER AND PRESCHOOL WILL ONLY PERFORM AT THE MATINEE. •TUESDAY, FEBRUARY 27, 2018: OPEN HOUSE, 5:30 to 7:30 pm- Please be sure to come! Let your child show you all the wonderful things he or she has been doing at school! This is one night you do not want to miss! In the next week or so, you will receive an Auction packet in your parent cubby, with all the details. We will also have everything available on the Auction page of our website. •TUESDAY, JANUARY 16, 2018, 2:00-3:00 PM: PRIMARY, KINDERGARTEN AND ELEMENTARY STUDENTS HONOR MARTIN LUTHER KING, in Steve's Barn. PLEASE NOTE: This date was changed on our calendar from Friday, 1/12/18 to Tuesday 1/16/18. If you have not yet signed up, please do so. If you do not see a sign-up sheet posted on, or next to, the door of your child's classroom, please see your child's teacher. Remember, there is no school for all students on Friday, Jan. 26th. Please try to schedule your conference on Friday. If Friday will not work for you or the sign-up is full, please see the alternative schedule for your child's teacher, Monday thru Thursday (1/22 - 1/25) or speak to the teacher to arrange a convenient time and date. School resumes Monday, January 29, 2018. RAN A TOTAL OF 5,307 LAPS (530.7 MILES)! Once again, we are so proud and impressed by the passion, commitment, determination and stamina, of every child who participated in the Jog-A-Thon fundraiser for the must! charities - Boys & Girls Club-Atascadero. You can print out the "thank you receipt" for and fill it out for everyone on your pledge list. Please don't hesitate to email if you have any questions. Many, many thanks, once again. •TUESDAY, NOVEMBER 21, 2017 - United Blood Services will bring the Blood Mobile to CHMS! They will be in our parking lot from about 8:30 am to 12:30 pm. Give Blood! By appointment only! See sign up on front desk or go online. This is a completely separate event from our school wide potluck (see below) and takes place in the lower elementary classroom, only. Lower Elementary parents, please see the food sign-up on the classroom door. If you have any questions, please see Nancy. 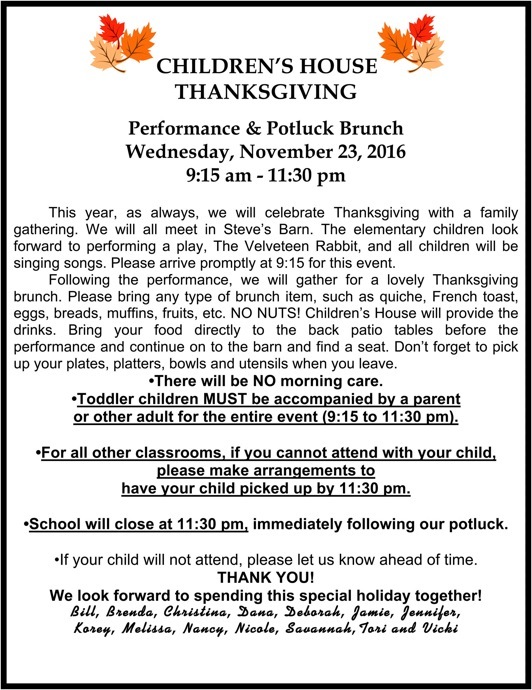 Following the performance, we will gather for a lovely Thanksgiving brunch. Please bring any type of brunch item, such as quiche, French toast, eggs, breads, muffins, fruits, etc. NO NUTS! Children’s House will provide the drinks. Bring your food directly to the back patio tables before the performance and continue on to the barn and find a seat. Don’t forget to pick up your plates, platters, bowls and utensils when you leave. •There will be NO morning care. •THURSDAY, NOVEMBER 23 and FRIDAY, NOVEMBER 24 2017, SCHOOL WILL BE CLOSED for the Thanksgiving holiday. Again this year the entire school (even some toddlers) will participate in our 7th annual Jog-a-Thon. All proceeds will benefit must! charities/Boys & Girls Project. Parents, you will receive a letter and sponsor sheet for each child, in your Parent Cubby. Last year we raised $5000.00. Let's do it again! REMEMBER: You don not need to return the sponsor sheet, only the donations! •THURSDAY, NOVEMBER 23 and FRIDAY, NOVEMBER 24, 2017, SCHOOL WILL BE CLOSED for the Thanksgiving holiday. We recognize that Halloween (Tuesday, Oct. 31) is a great deal of fun for many families and every family has their own traditions. Going on a Sunday excursion to choose a perfect pumpkin, may be one. Sitting around the dinner table while Mom or Dad carves a pumpkin and bakes the seeds in the oven, may be another. Of course dressing up with make-up and posing for pictures is a tradition for many. At Children’s House, however, especially with the younger children, we keep Halloween pretty low key. A mask project or pumpkin carving may be going on or perhaps face painting on Halloween afternoon. The older children learn about the history of the holiday and some variations in various cultures. The upper elementary class will pay tribute to men and women in history and each student will be dressed as a historical person they have researched. They will present a first person report to their classmates and will also take a walk around to the other classrooms and tell the children who they are. •FRIDAY, NOVEMBER 10, 2017: SCHOOL WILL BE CLOSED for Veteran's Day. Again this year the entire school (even some toddlers) will participate in our 7th annual Jog-a-Thon. All proceeds will benefit must! charities/Boys & Girls Project. Parents, you will receive a letter and sponsor sheet for each child, in your Parent Cubby. Last year we raised $5000.00. Let's do it again! •TUESDAY, NOVEMBER 21, 2017 - United Blood Services will bring the Blood Mobile to CHMS! They will be in our parking lot from about 8:30 am to 12:30 pm. Give Blood! •School will close at 11:30 pm, immediately following our potluck. •If you purchased a produce bag for our fundraiser, don't forget to pick it up today, TUESDAY, OCTOBER 3rd, after 1:00pm. •"PASTA THURSDAY", BEGINS OCTOBER 5th! •TUESDAY, OCTOBER 24 and WEDNESDAY, OCTOBER 25 ARE BOTH PICTURE DAYS! John will be spending two days at Children's House. On Tuesday, he will shoot individual portraits for the Tuesday/Thursday/Friday toddlers, the Monday thru Friday toddlers, all preschool children and all siblings for the groups listed above, regardless of class. He will also be shooting ALL class photos on Tuesday. Parents of Monday/Wednesday toddler children, please bring your child to school on Tuesday for the class photo at 11:30 am. This time is approximate and you may or may not need to wait for a bit. On Wednesday, John will shoot individual portraits for the Monday/Wednesday toddlers, all kindergartners and all elementary students. Local Templeton supplier, Melanie Blankenship of Nature’s Touch Nursery and Harvest, is willing to deliver produce bags to our school every Tuesday afternoon beginning Oct. 3rd through Dec. 19th. If you are interested in participating in this Fundraiser please print and return the form with your payment or pick up a form at school. Checks should be made payable to Children’s House Montessori School and put in the basket labeled “PRODUCE BAGS” in the school foyer area. Please return your form and check by Monday, Sept. 25th. You can pick up your bag inside the coffee shop (MOCHA) beginning at 1:00 pm. on Oct. 3rd. If you are unable to pick up your bag please make arrangements for pickup by someone else. Any bags not picked up by 3:00 pm Wednesday will be donated to the school for student and staff use. •PARENT PROJECT VOLUNTEER FORMS: YOU RECEIVED A LETTER AND A LAVENDER FORM IN YOUR PARENT CUBBY! Please return your form by Wednesday, Sept. 27th. You must return your form whether or not your child wants to participate. with Simone Huls, Ph.D., Licensed Speech-Language Pathologist (CA SP 25805). Please see the information we placed in your parent cubby. Our annual school roster will be out in two or three weeks and will be distributed to all families. Please check one of the rough draft copies, posted on the Toddler or Primary sign-in sheets, by the front door of the Lower and Upper Elementary classrooms, or on the front desk, to make sure all the information is current! Feel free to make any necessary changes. Please initial after you have checked your info (even if everything is correct). Our roster includes email addresses. If you do not wish to include your email, address or phone number on our roster, please let us know. FYI: This is not for school staff to contact you in an emergency. We have special emergency cards for that. This is for parents to contact one another or children to get in touch with friends, etc. Bonjour! Buenos Dias, Shalom, Gutentag, Ciao... to all Parents, Families and Friends! 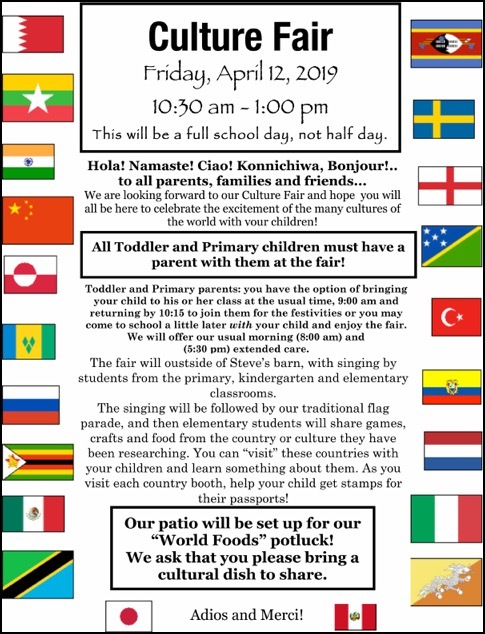 We are looking forward to our Culture Fair and hope you will all be here to celebrate the excitement of the many cultures of the world with your children! All Toddler and Primary children must have a parent with them at the fair! Toddler and Primary Parents: You have the option of bringing your child to his or her class at the usual time, 9:00 am and returning by 10:15 to join them for the festivities or you may come to school a little later with your child and enjoy the fair. We will offer our usual morning (8:00 am) and afternoon (5:30 pm) extended care. The fair will open in Steve’s Barn, with singing by students from the primary, kindergarten and elementary classrooms. The singing will be followed by our traditional flag parade, and then elementary students will share games, crafts and food from the country or culture they have been researching. You can “visit” these countries with your children and learn something about them. 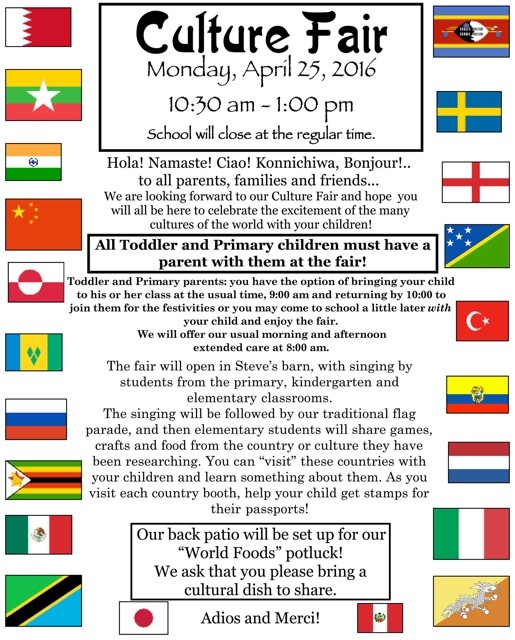 As you visit each country booth, help your child get stamps for their passports! Our patio will be set up for our "World Foods" potluck! We ask that you please bring a cultural dish to share. THIS WILL BE A FULL SCHOOL DAY. The school day ends at 3:00 pm, as usual and we will have afternoon Extended Care until 5:30. Please check your parent cubby for your forms. WE HAVE DECIDED IT'S A LITTLE TOO COLD AND TOO WET FOR AN OUTDOOR SPRING CLEANING DAY, next Friday, March 10th, as previously scheduled. Therefore, we would like to put most of our energy into our classrooms. We are in need of some repair jobs if you would like to volunteer for that. Otherwise, this year we will call it a Teacher Work Day instead of a Family Work Day. Please let us know if you were planning to stop by and we can discuss a few little projects. We would love to have your help with the garden and chickens during a school day, later in the Spring. This is one night you do not want to miss! In the next week or so, you will receive an Auction packet in your parent cubby, with all the details. We also have everything available on the Auction page of our website. PLEASE RETURN YOUR PINK, ITEM DESCRIPTION FORM AND YOUR BLUE, DINNER RESERVATION FORM ASAP! If you have not yet signed up, please do so. If you do not see a sign-up sheet posted on, or next to, the door of your child's classroom, please see your child's teacher. Remember, there is no school for all students on Friday, Jan. 27. Please try to schedule your conference on Friday. If Friday will not work for you or the sign-up is full, please see the alternative schedule for your child's teacher, Monday thru Thursday (1/23 - 1/26) or speak to the teacher to arrange a convenient time and date. School resumes Monday, January 30, 2017. RAN A TOTAL OF 3,989 LAPS (398 MILES)! Once again, we are so proud and impressed by the passion, commitment, determination and stamina, of every child who participated in the Jog-A-Thon fundraiser for the must! charities - Big Brothers, Big Sisters. This year, as always, we will celebrate Thanksgiving with a family gathering. We will all meet in Steve’s Barn. 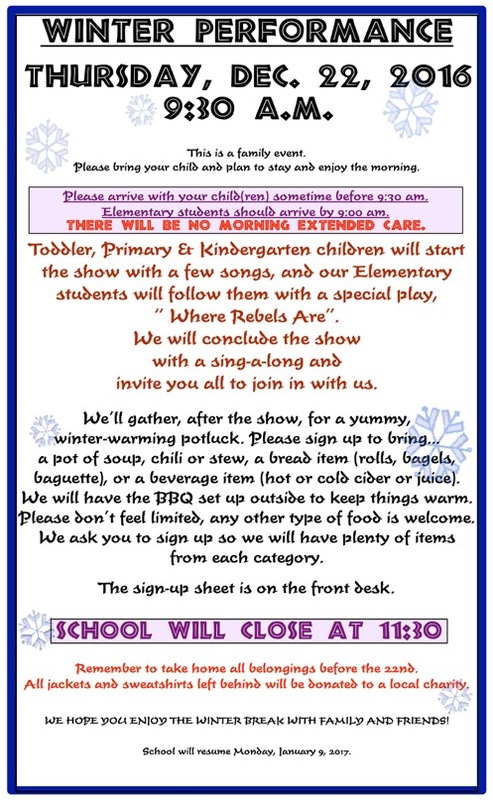 The elementary children look forward to performing a play, The Velveteen Rabbit, and all children will be singing songs. Please arrive promptly at 9:15 for this event. •THURSDAY, NOVEMBER 24 and FRIDAY, NOVEMBER 25, 2016, SCHOOL WILL BE CLOSED for the Thanksgiving holiday. •IMPORTANT CHANGE ON OUR SCHOOL CALENDAR: We have changed the date for our Auction Dinner, to Saturday, March 18th, 4:00pm. Please save the date! •FRIDAY, NOVEMBER 11, 2016: SCHOOL WILL BE CLOSED for Veteran's Day. •MONDAY, NOVEMBER 14 and TUESDAY, NOVEMBER 15 ARE BOTH PICTURE DAYS! John Alden from J.A Photography, will be taking individual portraits as well as class/group pictures. J.A Photography has been photographing Children's House students for over 25 years. Envelopes will be placed in your Parent Cubby soon. Watch for them! John will be spending two days at Children's House. On Monday, he will shoot individual portraits for the Monday/Wednesday toddlers, the Monday thru Friday toddlers, all preschool children, all kindergarten children and all siblings for the groups listed above, regardless of class, (and only if siblings have a separate envelope). In the spring, we photograph every child. In the Fall, we photograph every child who has returned an envelope. If you would like siblings to be photographed, you must fill out and return a separate envelope for siblings. On Tuesday, John will shoot individual portraits for the Tuesday/Thursday/Friday toddlers, and all elementary students. and all siblings for the groups listed above, regardless of class, (and if siblings have a separate envelope). In the spring, we photograph every child. In the Fall, we photograph every child who has returned an envelope. If you would like siblings to be photographed, you must fill out and return a separate envelope for siblings. He will also be shooting ALL class photos on Tuesday. Parents of Monday/Wednesday toddler children, please bring your child to school on Tuesday for the class photo at 11:30 am. This time is approximate and you may or may not need to wait for a bit. Class photos are free if you order a packet. If you do not want individual photos of your child(ren), you must fill out an envelope for a class photo. Again this year the entire school (except toddlers) will participate in our 6th annual Jog-a-Thon. All proceeds will benefit must! charities/BIG BROTHERS, BIG SISTERS. Parents, you will receive a letter and sponsor sheet for each child, in your Parent Cubby. Last year we raised over $7000.00. Let's do it again! We recognize that Halloween (Monday, Oct. 31) is a great deal of fun for many families and every family has their own traditions. Going on a Sunday excursion to choose a perfect pumpkin, may be one. Sitting around the dinner table while Mom or Dad carves a pumpkin and bakes the seeds in the oven, may be another. Of course dressing up with make-up and posing for pictures is a tradition for many. At Children’s House, however, especially with the younger children, we keep Halloween pretty low key. A mask project or pumpkin carving may be going on or perhaps face painting on Halloween afternoon. The older children learn about the history of the holiday and some variations in various cultures. The upper elementary class will pay tribute to men and women in history and each student will be dressed as a historical person they have researched. They will present a first person report to their classmates and will also take a walk around to the other classrooms and tell the children who they are. This year, they will be making their presentations on Monday, Nov. 2nd. •School will close at 12:00 pm, immediately following our potluck. Local Templeton supplier, Melanie Blankenship of Nature’s Touch Nursery and Harvest, is willing to deliver produce bags to our school every Tuesday afternoon beginning Oct. 4th through Dec. 20th. If you are interested in participating in this Fundraiser please print and return the form with your payment or pick up a form at school. Checks should be made payable to Children’s House Montessori School and put in the basket labeled “PRODUCE BAGS” in the school foyer area. Please return your form and check by Thursday, Sept. 22nd. You can pick up your bag inside the coffee shop (MOCHA) beginning at 1:00 pm. on Oct. 4th. If you are unable to pick up your bag please make arrangements for pickup by someone else. Any bags not picked up by 3:00 pm Wednesday will be donated to the school for student and staff use. Our annual school roster will be out in a week or two and will be distributed to all families. Please check one of the rough draft copies, posted on the Toddler or Primary sign-in sheets, by the front door of the Lower and Upper Elementary classrooms, or on the front desk, to make sure all the information is current! Feel free to make any necessary changes. Please initial after you have checked your info (even if everything is correct). Our roster includes email addresses. If you do not wish to include your email, address or phone number on our roster, please let us know. FYI: This is not for school staff to contact you in an emergency. We have special emergency cards for that. This is for parents to contact one another or children to get in touch with friends, etc. School has begun and there is so much to do! There is information in this email, regarding every classroom and every child, so PLEASE READ. WE ARE A PEANUT FREE SCHOOL! in your child's lunch or classroom snack! Other nuts, including tree nuts, are acceptable. and feel this is the only way to insure their safety. We appreciate your cooperation and understanding in this matter. PLEASE DON'T FORGET TO CHECK YOUR PARENT CUBBY EVERY DAY! You probably have a NEW NUMBER this year, so please check the list! TODDLER, PRIMARY (PRESCHOOL) OR KINDERGARTEN, DO NOT FORGET TO SIGN YOUR CHILD IN WHEN YOU ARRIVE AND SIGN HIM OR HER OUT WHEN YOU LEAVE. Each year, at Children’s House, we offer a Hot Lunch “Pizza Day” Program. Parents love having a day off from making lunches and the children enjoy this restaurant style novelty. Thanks to Brenda Gates, “Pizza Day” returns again, this year! It will be offered once a week, on Wednesdays, throughout the school year. It will consist of a local, delicious, cheese pizza, a side vegetable, fruit and juice. The Upper Elementary class will prepare and serve the lunch to all the children who would like to partake. Please see the Hot Lunch form in your parent cubby and return your form whether or not your child will partake. See Parents section and/or the Calendars section. Watch for a new issue of the The Quailblazer Times coming the end of September. We hope you have been enjoying your time together this summer...soon it will be time to begin our 2016/2017 school year and we are looking forward to gathering together once again! •We use email almost exclusively, to keep in touch with our families. Please check your email regularly for important classroom and/or school information. •Every family has a Parent Cubby. This is different from the cubby your child may have in his or her classroom. Please check your parent cubby daily. We also have a monthly email newsletter called The Quailblazer Times. We have automatically placed you on the list to receive it. We hope you will read it with your child(ren). The first issue will be out mid to late September. If you'd like to see what it's like, please check out our back issues. We're also on Twitter, Facebook, Pinterest, and Instagram if you'd like to stay connected with us! •We currently have a few openings in our toddler classroom. If you have a friend or family member who may be interested, please have them call or email the school. •New students and kindergartners must have all immunizations. This is now the law in California and we are required to comply. If your child will be here for the first time in September, their teachers will give them an individual 15 to 20 minute orientation on Friday, Sept. 2nd. This is a valuable time for them to be introduced to some of the activities in the classroom. Appointments are made on the half hour. If you have not already done so, email us with the half hour you prefer. We will email or call you back only if we must reschedule. We will be on hand both days (Friday and Saturday) to collect any remaining enrollment forms and answer any questions you may have. If your child attended summer school, they do not need an orientation. Please join us as we kick off the new school year and gather together for our annual potluck (appetizers and drinks only) on Saturday, Sept. 3. This is an informal open house...come any time between 2:00 and 4:00 pm and bring an appetizer. This is a great opportunity for the children to get acquainted or reacquainted with school, their friends and teachers. It is also a valuable time for parents to see old friends, meet new families, set up carpools and chat with teachers! Hope to see you all here! *If you still have forms that need to be filled out and returned, please bring them to us before school begins. WE MUST HAVE THE FOLLOWING FORMS ON FILE BEFORE YOUR CHILD CAN BEGIN SCHOOL: A CURRENT EMERGENCY FORM, A CURRENT CONSENT FOR MEDICAL TREATMENT FORM, AND A CALIFORNIA IMMUNIZATION FORM. If you have not yet returned your forms, please do so BEFORE THE FIRST DAY OF SCHOOL. The sooner we can get your child's file completed, the better. It will also make the first week run smoother. Thank you. •TUESDAY, SEPTEMBER 6, 7:00 - 8:30 PM / PRIMARY (PRESCHOOL & KINDERGARTEN) THIS IS THE FIRST DAY OF SCHOOL! ON TUESDAY, MAY 3, 2016: JOHN WILL PHOTOGRAPH THE TUESDAY, THURSDAY, FRIDAY TODDLERS, THE TUESDAY, THURSDAY, FRIDAY PRESCHOOL STUDENTS, ALL ELEMENTARY STUDENTS AND ALL SIBLINGS FOR GROUPS LISTED ABOVE, REGARDLESS OF CLASS. ON WEDNESDAY, MAY 4, 2016: JOHN WILL PHOTOGRAPH THE MONDAY & WEDNESDAY TODDLERS, THE MONDAY THRU FRIDAY TODDLERS, THE MONDAY & WEDNESDAY PRESCHOOL, THE MONDAY THRU FRIDAY PRESCHOOL AND ALL KINDERGARTEN STUDENTS, PLUS ALL SIBLINGS FOR GROUPS LISTED ABOVE, REGARDLESS OF CLASS. 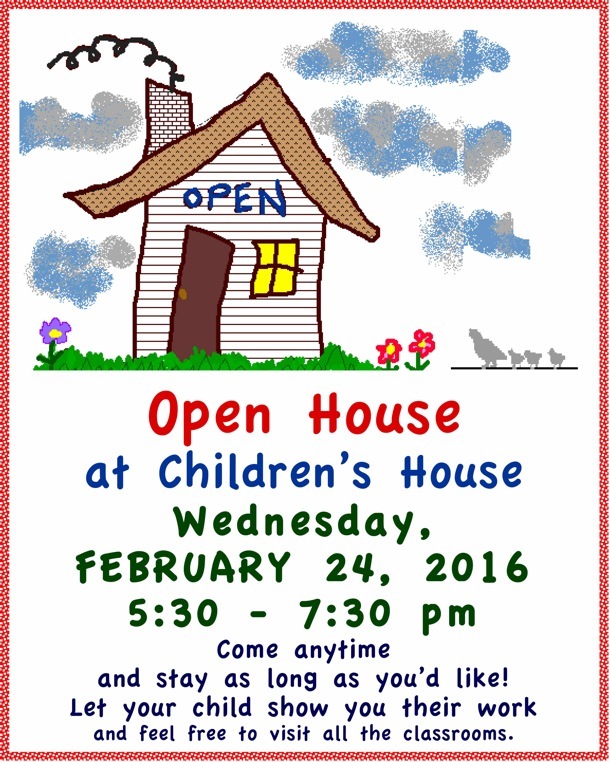 •WEDNESDAY, FEBRUARY 24, 2016: OPEN HOUSE This is probably the best evening of the school year! Our Open House at Children’s House is an evening that belongs to your children. They are your guides as they show you all the materials and activities they have learned to use at school. It is also an opportunity for you to chat with other parents, the teachers and visit other classrooms. The school will be open from 5:30 to 7:30. You are welcome to arrive at any time and stay as long as you’d like. Please don’t miss this wonderful event! •WEDNESDAY, MARCH 2, 2016: PARENT EDUCATION- "COMPARING MONTESSORI WITH THE TRADITIONAL CLASSROOM"
Join us from 6:00 to 7:00 pm for an exciting discussion on some of the key components of a Montessori classroom that are not usually found in a traditional classroom. Childcare will be provided in Steve's Barn! This is one night you do not want to miss! You received an Auction packet in your parent cubby, with all the details. We also have everything available on the Auction page of our website. PLEASE RETURN YOUR PINK, ITEM DESCRIPTION FORM AND YOUR BLUE, DINNER RESERVATION FORM ASAP! If you have not yet signed up, please do so. If you do not see a sign-up sheet posted on, or next to, the door of your child's classroom, please see your child's teacher. Remember, there is no school for all students on Friday, Jan. 30. Please try to schedule your conference on Friday. If Friday will not work for you or the sign-up is full, please see the alternative schedule for your child's teacher, Monday thru Thursday (1/26 - 1/29) or speak to the teacher to arrange a convenient time and date. School resumes Monday, February 2, 2015. WE ARE NOW A PEANUT FREE SCHOOL! We hope you have been enjoying your time together this summer...soon it will be time to begin our 2015/2016 school year and we are looking forward to gathering together once again! •Visit our blog! We try to bring you events, updates, fun stuff, news from the school and individual classrooms. We also try to include Montessori articles and tidbits from around the world, as well as some of the latest news in education. Check in regularly. We're also on Twitter, Facebook and Pinterest, if you'd like to stay connected with us! •We currently have a few half day openings (9-12), Monday thru Friday, in our primary (preschool) classroom. If you have a friend or family member who may be interested, please have them call or email the school.